We have a new Videogame review up on our Members Content Blog! This one is for the Massively Multiplayer Online Real Time Strategy Collectable Card Game (MMORTSCCG), BattleForge. Head over to the Members Content Blog to read it HERE! As always, feel free to leave thoughts, praise and comments at the bottom of the page. AMCC is having an Open Day this week and all are welcome, members and non-members! 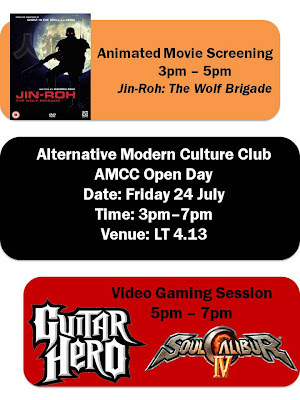 We'll kick off the session with an Animated Movie Screening, followed by a games demonstration of Guitar Hero World Tour, Soul Calibur and other games. 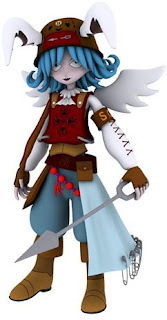 Well, this post is waaay overdue...but better late than never! Here's my take on our previous 2 outings. The following week, we attended the second day of Cosfest VIII at Downtown East. I guess we should have gone down on the first day where there were more people. But nevertheless, we still achieved the great feat of getting good buys (again!). There were a lot of stuff for sale at the booths. Cosplay-wise, we saw the return of the awesome GUNDAM! There were also other interesting cosplayers like the people with pitchforks and the guy with the TV head (my apologies for not knowing their characters)...but mostly, we were there to support our cosplayers, Yanshuang and Seri. Check out my photos of them here if you haven't done so. This Sunday, 12 July 2009 there's an unoffical outing to Cosfest VIII at Downtown East. We will be gathering at 12.45pm at Pasir Ris MRT station. If you are interested in joining us for this event, let us know by dropping us an email at amccsg@gmail.com or send an sms to Albert.